The macula is an area of the retina (the ‘film’ of the eye located in the back of the eye) that is responsible for detailed central vision. Age related changes can cause this area to degenerate. This condition is the leading cause of blindness in seniors. 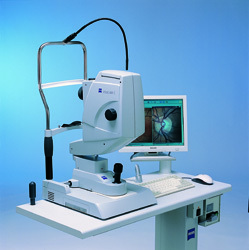 Peripheral or side vision is not usually affected. We diagnose this condition by looking at the back of the eye with certain lights and by taking pictures of the back of the eye. There are some hereditary components associated with this disease. Smoking , light colored eyes ,UV sun exposure cardiovascular disease and low macular pigment are known risk factors. We have acquired a new Test (Visucam 200 MPD) that can measure as well as track the amount of macular pigment in the eye to help assess the potential risk of developing macular degeneration. Certain vitamins and supplements have been shown to elevate the levels of macular pigment and slow the progression and can be prescribed if early signs of macular degeneration are seen or if low macular pigment levels are measured.